M.L. 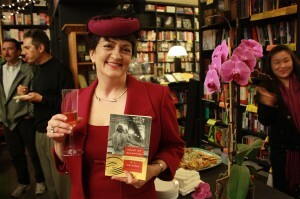 at the book launch party for Heart of Deception at Book Soup in West Hollywood. Connecting with my readers is always inspirational, so please feel free to get in touch with me and I will get back to you. And I LOVE visiting with book clubs. I will call in, video conference, Skype, or, if at all possible, actually show up in person to chat with any reading group that selects one of my novels to read. I’ve meet with nearly a hundred book clubs all over the country, and have always had a wonderful time. I’d be delighted to visit yours! I enjoy doing presentations for writer’s groups, civic organizations, and any group that has an interest in my books, or the history behind them. 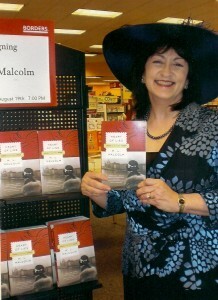 Becoming a Harper Collins author was incredibly exciting. 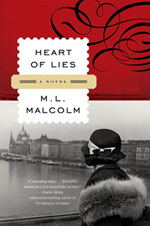 My novel, Heart of Lies, was selected as a “Next Great Read” by the American Booksellers Association, and chosen as a “Recommended Book Club Read.” I was also selected as an “Author to Watch” by Target Stores’ “Emerging Authors” program. 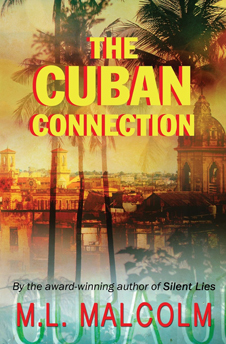 My latest book, The Cuban Connection is another historical thriller. This time the action takes place in Cuba, in 1960. It features ace reporter Katherine O’Connor, who has a nose for news and an inclination to use it in very dangerous places. Reporting undercover during the early days of the Castro regime, Katherine gets into serious trouble, and must find a way to save her own skin without making the people she loves pay for her freedom with their lives. The Cuban Connection contains rich historical details about how the Castro revolution evolved from a promise of peace and democracy to a tyrannical dictatorship, and why “normalcy” may be difficult to achieve. Please take some time to explore this website, and get to know me, my books, and something about the historical events that inspired it all.